After you install these library nodes, you will need to restart your Rasp Pi. Once Node-RED restarts, you use a web browser to build applications. If you are working directly on your Rasp Pi, enter 127.0.0.1:1880 in the URL address bar of your browser. 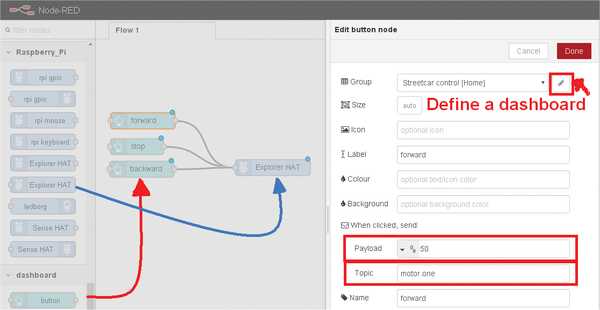 To make a web-based manual control program, drag three button nodes from the left node panel onto the center panel and wire them to an Explorer HAT output node (Figure 5). Figure 5: Node-RED Web dashboard logic. Double-click on a button node to open the edit window, which lets you configure the dashboard, labels, and button actions. To control the first Explorer HAT motor, enter the topic motor.one. The payload is between -100 and 100, which corresponds to full reverse and full forward, with 0 being stopped. After you have finished configuring Node-RED, click the Deploy button at the top right in your browser window. Deploying will run your program and enable the web dashboards. To access the web dashboards enter: http://<your-ip-address>:1880/ui (Figure 6). If you are unsure of your IP address, go to a terminal window and enter ifconfig (deprecated) or ip addr. 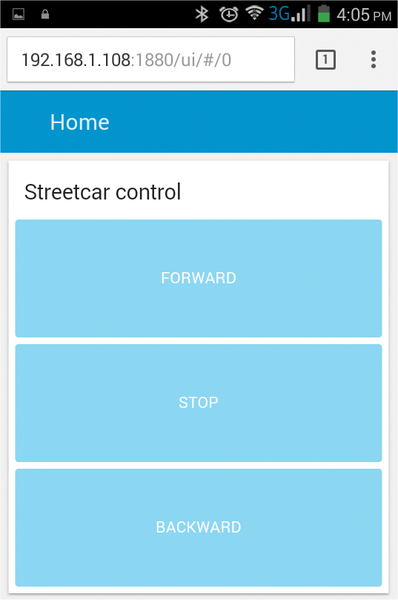 Figure 6: Streetcar manual control.